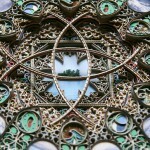 Fabulous collection of paper art by American artist Eric Standley represents his individual style. 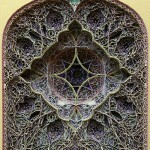 Meanwhile, in order to achieve such peacefully meditative forms, he applies several layers of lace cut paper. 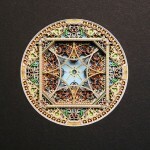 Brillant technique, great craftsmenship and glorious color of these three-dimensional works remind the work of jeweler. 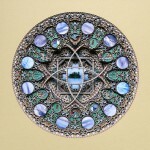 Undoubtedly, exquisite artworks by Eric Standley look classic and precious. 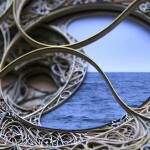 Meanwhile, Eric Standley graduated from the Massachusetts College of Art and Savannah College of Art and Design. An Associate Professor of Studio Art and the Foundations of Art and Design, he is Coordinator for the School of Visual Arts at Virginia Tech. According to Standley, he sleeps on rare occasions and dreams through hard work and concentration, one day to become a modernist. Also, he holds allegiance to a faith of his own construction, reinvented on a daily basis. Besides, the artist explains, that his vector drawing practice is inspired by geometry from Gothic and Islamic architectural ornamentation. He tries to capture a reverence for the infinite. He is interested in the conceptual migration from the permanence and massiveness of stone to the fragility and intimacy of paper. 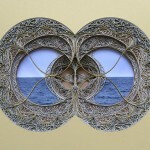 Also, inspired by the idea of combining twelfth-century aesthetics with a contemporary technology-based practice.